The San Jose Blog: Two New Proposed Downtown Apartment Buildings! Two New Proposed Downtown Apartment Buildings! The good news for Downtown development keeps on trickling in. 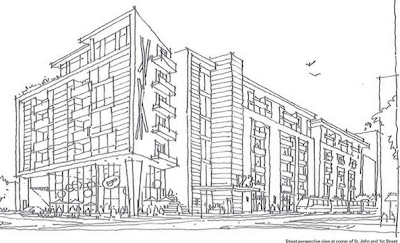 Last week two new proposals came in for major residential development projects. The first is a 19-story hi-rise at Post St. and San Pedro (next to Myth and right around the corner from One South Market). This would consist of 156 units consisting of studios, 1BD, 2BD, and 3BD apartments. There would also be large amenity decks on the 4th and 17th floors, underground parking, and 4,100 SQFT of retail. The location of the proposed building can be seen in the 3rd image below. 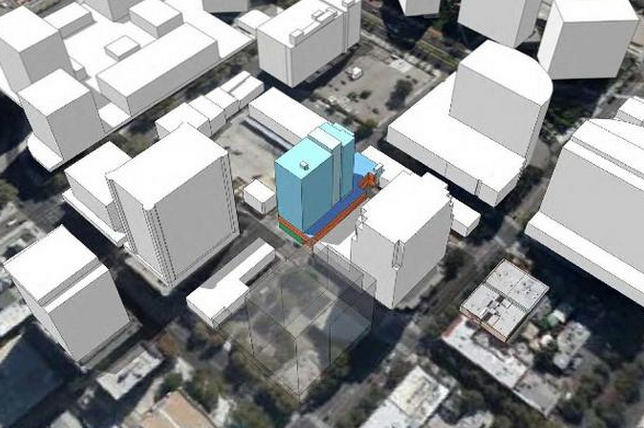 The second project would consist of a 7-story building with 195 units (studios, 1BD, and 2BD apartments) on 1.4 acres fronting Saint James Park and First Street. This would be the first residential project of this scope to break ground in the area, and hopefully could be a catalyst to cleaning up the park. 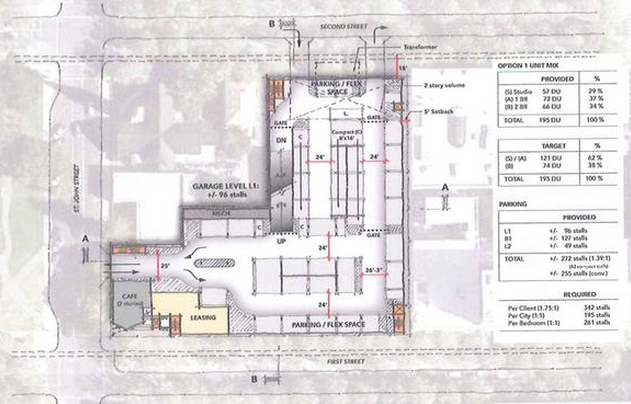 As for retail, this would include a corner Cafe. The Downtown skyline is going to be quite a bit different 5 years from now! Very cool! Amazing how many new porjects are springing up! Is the middle graphic on this post a depiction of the First/St. James building? If not, do you know of one? 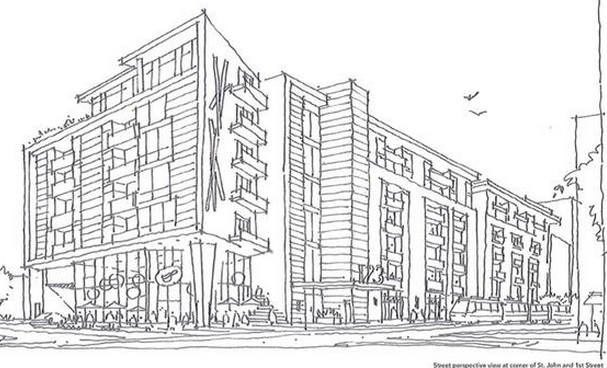 Yes, that is a rough sketch of what that building could look like. You can even see the cafe in the corner. Refreshing viewpoint, although I'm not sure I agree. Skyscrapers are the only easy ticket to big city respect. But this is San Jose, so we never do things the easy way. I agree with the opinion above that 7 stories seems appropriate for this location... not so much to fit in with the shorter buildings to the north of St. James park, but to fit in with the immediately adjacent historic church. However on the whole, I think that high-rises are the way to go in downtown SJ -- not so much for 'big city respect', but because they bring the most people downtown in the smallest amount of land. The biggest thing downtown needs right now is just MORE PEOPLE. High-rises are a good way of accomplishing that. will the post street building take out blank club???!! !